The RV Doctor: More Info about the RV Doctor Website! More Info about the RV Doctor Website! You can read each new print version of House Calls with the RV Doctor column in Family Motor Coaching Magazine. And check out the Doctor's Orders in each issue of RV Open Road Magazine. Gary also wrote and produced the safety DVD presented by RVSEF entitled, "Testing Your Motorhome Air Brakes." It's a "must have" for any coach equipped with air brakes! You can order your copy by clicking on this link. Be sure to stop by the RV Doctor's YouTube channel for lots of informational videos. And to see more videos, go to this website. If you're interested in a full-timer's home base, check out the benefits of the RV Chalet. Or see what the Doc thinks of some aftermarket RV products by visiting the Product Spotlight pages. Gary is also available for presenting on-site, in-person, instructional and entertaining seminars at your next Rally or RV Show. Email the RV Doctor at gbunzer@hotmail.com for scheduling and pricing information. Enjoy perusing the pages of RVdoctor.com! Be sure to bore down deep; many of the articles and individual questions and responses have internal links. And remember, RVing is more than a hobby, it's a lifestyle! And the RV Doctor may just see you down the road! In all instances, every effort is made to ensure the correctness of all content on the RV Doctor Website. It is imperative that if you choose to follow any instructions or procedures outlined on any page of this website, you must first satisfy yourself thoroughly that neither personal nor product safety will be compromised or jeopardized. If you are in doubt or do not feel comfortable about a procedure, do not continue. Simply call your local RV service facility and make an appointment with them. The advice, recommendations and procedures offered by the RV Doctor are solely those of Gary. They do not necessarily reflect the opinions, procedures and recommendations of our sponsors or advertisers. Here are more than 1,000 special deals, just for today. And the items just keep on changing. If you can’t find a great deal here on something you want, then, well, you must not need anything. If nothing else, it sure is fun to poke around here to see the incredible array of cool stuff that’s available at this very moment at bargain prices! Click here for today’s deals! 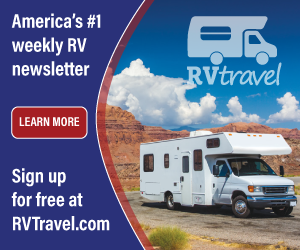 Thanks for visiting the RV Doctor Website, the official home of author, technical educator and RV/MH Hall of Fame member, Gary Bunzer, featuring select questions from his popular column, The RV Doctor. The RV Doctor Column recently celebrated 42 years of continuous monthly publication making it one of the longest, if not THE longest, running Q&A technical advice columns in the RV Industry! Read more info about the RV Doctor Website here. Submit your question to the RV Doctor here. Copyright © 2009 The RV Doctor.